When someone says the words salt and water, the mind probably most often goes to the ocean. It sound strange that people own salt water pools, but they absolutely do. The main difference between salt water pools and traditional pools is how they are sanitized. A traditional pool uses chlorine based products, for example. Whether a salt water pool is a good option for you is your choice. Here are some things to consider. For the most part, sanitizing a traditional pool involves regularly treating the water with chlorine. There is a chlorinator attached to the filtration system which disperses the cleaning agent. The owner will add chlorine on a scheduled basis, which is usually weekly or biweekly. A salt system works a little differently. The two components are the salt cell and the control box. The salt cell is connected to the control box through two pieces of metal. An electrical charge from the control box through the metal plates starts a process called electrolysis. The water flows through the salt cell and the salt that it carries with it turns into hypochlorous acid. 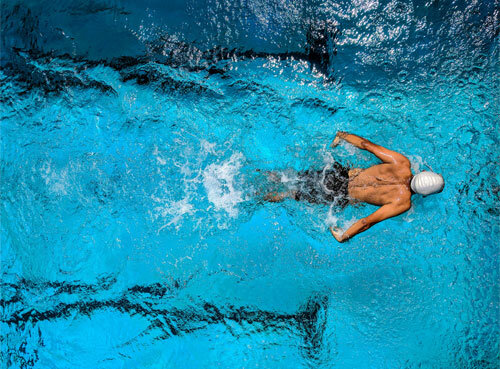 The chlorine that is used in traditional pools is a form of hypochlorous acid. With salt water pools, there is nothing really added into the water to sanitize it. You can control how much salt is mixed in with the water at any given time through the control box. It will have buttons that make it easy to control. You can also “shock” the pool by using the control box’s boost mode, which outputs the salt at a maximum level to give the pool a quick cleaning. The main benefit that people appreciate about salt system is that they do not have to work with chlorine. It is only present in the water through the hypochlorous acid, so there is no need to handle it in any way, whether it is dropping in tablets or scooping out from a bucket. There is still chlorine in the pool, but since it is diluted it is less harsh. Also, once you have added the salt, there is less work involved. The control box does the work, and you will not have to regularly place chlorine in the pool or shock it. You only have to use the control box to control the salt output. What are the Cons of a Salt System? One of the biggest downsides of a salt system is that the initial investment is much higher than with a traditional sanitization system. Also, just like with chlorine, the pool service company does have to be careful with the salt. If your pool has metal ladders or railings, then you will have to replace them with plastic versions since metal can corrode when exposed to salt over time. Another option is to install a zinc anode by the filter. This anode will absorb the electrical current that comes into the water the water. Since zinc is a soft metal, the current will hit the anode first, and it will take the brunt of that excess current and salt. This means that you may only have to replace these anodes, which is quite simple, as opposed to the other metal accessories in the pool. Another issue is that the drops of water from the pool can damage the deck if it is not salt-friendly. Wet bathing suits or even splashes from the pool will leave salt residue on the deck, which can corrode the material and leave stains. The deck must not be flagstone, bluestone, or travertine. If you contact a professional, they can advise as to whether a salt system is right for you. When making the decision, you can weigh the pros and cons to decide whether a salt system is the appropriate option for your pool.